As we review a detailed description of each consciousness energy level keep in mind that a person can be at various levels in different aspects of their life. It is the average aggregate of a persons overall consciousness that determines the level they are at. For instance someone may jump between Desire, Anger and Pride and therefore their average level may be Anger. It is not uncommon for someone to relate to many of these states at some time or another in their life, but one of them will tend to dominate our consciousness. Shame is a level at which death may be chosen through active suicide or the failure to actively prolong life. Shamed people feel humiliation or a sense of being discredited or of “losing face.” They seek to hide becoming invisible. In shame a person becomes withdrawn, shy and introverted. It is portrayed or known in society as “hanging your head in shame.” There is a sense of banishment which can lead one to seek death as a solution. Shame in general is destructive to ones emotional and psychological health and can often manifest as physical illness or death. It can also manifest as cruelty towards oneself or to others. Guilt results in an unforgiving emotional attitude. Guilt can be directed inwardly or projected outward. There is a strong sense of wanting punishment or punishing others. Societies often utilize public punishment to gratify their own guilt ridden conscience. Guilt can provoke rage and can be expressed in killing. It often leads to self-rejection, remorse, feeling bad and self-sabotage. Unconscious guilt can result in psychosomatic disease, accidents and suicidal behaviors. Many people struggle with some level of guilt their entire lives. Guilt can be exploited by others for coercion and control of those who are guilt ridden. Apathy is a state of helplessness depicted by poverty, despair, depression and hopelessness. It is a state that elicits pity from others. The consciousness energy level is so low that one is unable to help themselves, even though help may be available. These include the homeless and people of old age who live in isolation or suffer from chronic and progressive diseases. Apathy is best described as the level in which one abandons all hope. According to Hawkins approximately one third of the worlds population lives at this level or below. This level is characterized by sadness, loss, bereavement and remorse of the past. Experiencing a major loss early in life can lead one to accepting grief and sorrow as a consequence of life itself. People at this stage tend to project their grief out into the world viewing everything as sad. This is the level of habitual losers and chronic gamblers, they accept failure and loss of jobs, money, friends, health, family and opportunities as part of their lifestyle. One of the characteristics of grief is the notion that something considered dear and valuable cannot be replaced. When such loss occurs it can lead to serious depression or even death. Grief still has more energy than apathy, so as one starts to experience grief from an apathetic state, they are in fact moving up in energy. Fear is a state most everyone experiences in and out of their normal mode of consciousness. While grief is concentrated on the past, fear is more about the future. This state is far removed from the lower states leading to death or suicide. Fear indicates a concern for our well being or safety, thus it is an indication of wanting to preserve ones life. Fear is used extensively in advertising, media and politics as a means to exploit people. When fear becomes a person’s main focus they are subject to paranoia, jealousy and neurosis. Fear is difficult to rise above and leads to inhibitions. People at the level of fear can be led higher by those who demonstrate they have conquered their fears. In an interesting way, fear can actually be a powerful motivator as many people structure a great deal of their lives around fear. Fear of death or disease can motivate people to live a healthy lifestyle. Fear of not having enough money can motivate people to be responsible with money and save for their retirement. Fear can also be destructive. The fear of losing a relationship can result in extreme jealousy. Fear can limit our experience of life when we are unwilling to face our fears. Some introspection into one’s own fears can reveal a great deal about ourselves and how it motivates us. This level is the basis for materialism and whole economies. People are able to overcome their fear by a strong desire for attention, power, achievement or material goods. We are able to expend great amounts of energy in order to satisfy our desires. Desire is played upon in the cosmetic and fashion industry as people seek sexual approval. Desire can manifest as greed and the need to accumulate or it can manifest as addictions, obsessions and compulsions. It is a strong attractor field and can become the dominant level of consciousness for many. Desire is the level associated with addictions as desire becomes a craving more important than life itself. Addictions take many forms such as the need for attention, amassing fortunes and sexual cravings. Desire becomes a self reinforcing trap as one desire is fulfilled another one rises to take its place. This produces a sense of never being satisfied, always wanting and craving more. Desire however can be a powerful motivator to the achievement of goals which when directed inward towards personal growth, can lead to higher levels of consciousness. The energy field of desire can lead to frustration for not getting what one desires, this frustration leads to anger. Anger can be used both constructively or destructively. It is expressed most frequently as resentment and revenge which is both volatile and dangerous. There is a sense of fear when interacting with people at this level because one never knows when their anger will erupt. When anger is used constructively it can be the catalyst for ushering in social or personal change. Anger used as a catalyst can bring determination and energize one to seek solutions. Used destructively it can lead to wars and killing. If one dwells upon anger it creates resentment, grudges and hatred which is both dangerous and destructive; effectively “eating away” at all areas of a person’s life. Those who dwell at this level can be difficult, litigious, irritable and prone to explosive episodes. These are people who have anger management issues. Offended easily, they keep a mental diary of every incident where they have been wronged. Anger is the base energy field prompting those at pride to defend their sense of self worth by spewing their anger, hatred and resentment towards others. Closed minded, unteachable, always on the defensive for being right, narcissistic vanity, won’t hear what you have to say, think they are hot stuff…enter the level of pride. Obviously people start to feel positive about themselves at this level. The reward for all the pain of rising through the lower levels is the beginning self esteem one “feels” at pride. Pride is on display daily by those who “strut their stuff.” Pride entices people to push their sense of pride into people’s faces. This is done by “dressing to the nines,” “showing off” their material possessions, “glorifying” their accomplishments, “gloating” over a win, “boasting” of their many travels, even pushing their children’s or spouse’s accomplishments as a sense of pride. People at this level may be insecure and unhappy but their pride will not allow them to show it. Pride projects the image that life is great, but behind the facade of their outward pretension their personal life can be a mess. The United States Marine corp attracts its recruits with pride in hopes of moving them up into courage. Pride is typically looked at favorably in society and is encouraged to the extent people take “stock” in themselves. After all, it is far better then the levels below it. Pride however is still below 200 and is therefore a weak level of consciousness. Here the ego is inflated and extremely vulnerable to attack. Pride therefore is vulnerable to being knocked off its pedestal back down to shame. As it is said “Pride Goeth Before a Fall.” To prevent this “fall” leads those at pride to be arrogant, divisive, defensive and vulnerable to attack, all of which leads to denial. These characteristics are not conducive to personal growth and stand as a major impediment to it. At the level of pride recovery from alcoholism or other addictions is impossible because all emotional problems and character defects are denied. The fact that one denies any shortcomings in themselves is due to their pride which does not allow them to progress. Pride must always be protected and therefore contains no real power, stature or prestige. Pride is related to an underlying fear, once a person faces this fear they can let go of pride and begin to align with the next attractor field of courage. Once a person advances into the levels of “power,” personal growth can occur much more rapidly. Beyond this level is where real stature and prestige can be achieved. Until this happens one is stuck at being a victim of their pride and will continue to place blame outside themselves. This level is the last great barrier to becoming accountable to oneself and achieving personal growth. The motto at this level is “I can.” This is where power first emerges as the positive aspects of life start to outweigh the negative. Here we start to explore our world with a sense of courage and enthusiasm. This leads to exploration, accomplishment, fortitude and determination. Whereas the lower levels are filled with pain and suffering, here we see life as challenging, stimulating and exciting. As we accomplish things and take charge of our life, each success adds to our self-esteem. Unlike pride which is a false sense of self-esteem constantly needing protection, the esteem one achieves at courage stays with us and cannot be taken away. For the first time we lift our sail and are willing to chart a course exploring life into the unknown. There are still fears but we muster the courage to face them in order to move forward in life. This may include pursuing education, a new job, working on our character defects, etc… What was once considered an obstacle at the lower levels, now becomes a challenge to overcome. For the first time we are contributing to life as much as we take. Courage allows us to look within for the source of our power. We no longer feel we are always the victim in life we now start to take responsibility for our experience of life. This is truly the beginning phase of self improvement, our only limitation beyond this point is ourselves. Since pride is due to an underlying fear, courage allows us to finally face our fears. We have the courage to face our emotions instead of being scared of them. As a result we start to gain control of our emotions by no longer being afraid of them. These little victories start to accumulate and give rise to more self-confidence. At the level of courage, our notion of what is possible starts to expand and with it so does our world. To this point personal gain was the primary motivation, at courage we start to develop an ability to give to others. Neutrality denotes a release from taking strong positions for or against things, instead we take a neutral position. Below this level people take on strong positions for or against things, this positionality creates opposition and division. Since having a strong position can lead to anger, frustration and disappointment, the need to have things be a certain way is released at this level. When we are no longer attached to a particular outcome then we can no longer be a victim. At this level of consciousness we release many painful emotions. Letting go of resistance brings much more power to an individual. Strong opinions create obstacles and difficulties, here we eliminate the obstacles and difficulties by no longer seeing them that way. Power is freed up by no longer being dominated by aversions and cravings. As we reach this level we develop a sense of well-being and confidence in our ability to deal with life. Fear is replaced with a sense of security and confidence knowing we can handle any situation. Since we are no longer rigidly attached to outcomes and have no desire to control others, we are able to “roll with the punches.” At this level people are undisturbed emotionally, are easy to get along with and safe to be around. They have no interest in conflict, competition or guilt. They no longer feel defeated, frightened or frustrated. Its OK if we don’t get our way because we are more flexible and non-judgmental. A person starts to develop a very real sense of inner confidence at this level and this leads to a true sense of power. With this new sense of inner power, we are not intimidated easily and are not out to prove anything. Due to these inner changes, one starts to value a sense of freedom and are therefore much harder to control. This level marks our willingness to participate in life on an active level. Not only do we perform a job, at this level we put in our “best effort,” as a result promotions and advancement occur rapidly. Growth is rapid in all areas of life and social and economic success follow automatically. A person at this level is “willing” to start at the bottom and work their way up and if unemployed are “willing” to take any job in order to work. They are not demeaned by lower jobs due to a high sense of intrinsic self-worth and self-esteem. They “know” their worth and their ability to contribute. This is reinforced often by those who give them recognition, appreciation, rewards, admiration and praise. Willingness allows one to face their inner issues and therefore will not have major roadblocks to continued learning. These people are builders and contributors to society. The have faced their shortcomings, are willing to learn from others and become teachable students of life. There is a sort of self reinforcing upward spiral that occurs from this level. We start to put our “best effort” into our participation with life. Life then starts to give back in ways that make us want to give more, and life then gives more and so on. At this level we begin to utilize the power of intention. People at this level tend to experience success and fulfillment in their life. It is the willingness to put forth our best effort in being a: great neighbor, friend, spouse, employee, volunteer, caretaker, sibling, coach, etc.., that enhances every area of one’s life. At this level of consciousness we have fully accepted, that we are the creator of our own life. We are the creator of our own happiness, it no longer lies out there somewhere. This is an enormous responsibility to accept, but with it comes an equally huge jump in power, awareness and consciousness. We understand that we alone have all the power we need to create our life as we desire. We begin to live harmoniously with the “forces of life.” We start to understand the bigger picture and begin to encompass more awareness into solving problems. This awareness utilizes balance, proportion and appropriateness in thinking and decisions. Because we are not interested in determining “right” or “wrong” we becomes focused on a common ground in all solutions. In the full awareness of our ability to find our own happiness we become conscious of our own limitations, which at this level we can now readily admit. We completely overcome denial as a result and can start to see ourselves more objectively. This level is free from discrimination and intolerance, we recognize equality while still honoring diversity. Regardless of our situation we can affect the circumstances such that it will bring about our happiness. Energy at this level is not only used but is given back out to the world as selfless service to others. This is what moves a person to the consciousness energy level of reason. Reason is the level of science, medicine and in general the great thinkers throughout history. Einstein, Freud, Supreme Court justices all calibrate at these levels. Intelligence and the ability to be rational dominates this level. Think of this as overcoming the narcissistic and emotional distortions common in the lower levels. Here we can handle complex amounts of data making rapid and correct factual decisions. The ability of comprehension and conceptualizing happens at this level as we are able to understand the intricacies of relationships, graduations, and subtle distinctions. Reason is linear and objective. At the level of reason there is a non-emotional respect for truth. Knowledge, facts and education are sought as a means to increase ones worth. Reason is highly effective in a technical environment where logic is required. Reason however can become a great barrier to reaching higher levels of consciousness. Intellectualizing can become a vicious cycle producing massive amounts of data, information and documentation. Without the ability to allow for a jump in “faith,” reason gets stuck in data alone. Therefore it does not allow for the subjective jump to spiritual truth. This is why only 4% of the worlds population moves beyond this level. This is the level of all great thinkers and “the great books of the western world.” Reason keeps one confined to the logical functioning and interpretation of the brain. Here emotions are subdued allowing for the clarity of data and facts to be processed. When reason evolves to a love of truth for its own sake it can lead to a paradigm jump in consciousness to the energy level of love. A great paradigm shift occurs at this level. Love exist in another dimension which is non-linear and subjective. We begin to enter the realm of consciousness contained in the heart/soul bypassing the brain altogether. The higher spiritual influences come through this heart intelligence before they are rationalized through the brain. Love starts becoming more unconditional, unchanging, permanent, forgiving, nurturing and supportive. At the lower levels love is directed, exclusive, selective and conditional, as it evolves beyond this point it becomes unconditional as a way of being. Love at the lower levels is conditional based on a “giving to get” motivation, it is more about dependency than actual love. The love that society portrays is one of intense physical and emotional attraction, possessiveness, dependency, control and addiction. This is not “true” love as evidenced by the fact that love can turn to hate. Love at this level and beyond becomes a lifestyle, a way of approaching all of life, a force that radiates from our being. Because it is not dependent on some condition, it springs from within and is therefore not subject to outside conditions. Due to the power of this attractor field, people at this level have a profound influence on others effectively attracting them to a higher level. Because love at this level is inclusive, incorporating all life, it expands ones sense of self and ones consciousness to incorporate all life. Love focuses on the good in life and has the ability to dissolve negativity by changing ones perspective. As people rise from this level they no longer blame anyone for anything, rather life is seen as a continuing learning experience in how to love. Love emanates from the heart and therefore cannot be accessed from the intellectual brain. Due to the purity of its motive it can lift others out of despair and accomplish great feats. Problems are approached from a global perspective with the ability for instant empathy without the need for facts and data. At this level the separating, divisiveness and judgment of the ego is subdued, love seeks to make all things whole. This is the level where true happiness is experienced. This happiness is the result of feeling this love within ourselves while still realizing that love exist as a force outside ourselves. According to Hawkins only 0.4% of the world population ever reaches the level of 540. As love becomes more and more unconditional, it begins to be experienced as true joy. This joy is a constant companion to all activities. The energy field at this level is where healing takes place and it is the level of all twelve step groups. Not only is it pleasurable to be around people at this level but we experience a higher level of energy within ourselves due to the energy that emanates from these people. From this level on up is the domain of saints, spiritual healers and advanced spiritual students. Here there is the capacity for enormous patience and a continuing positive attitude in the face of prolonged adversity. The ability to be compassionate starts at this level. Inner joy, quietness and an inner “knowing” occurs as we begin to connect with a source that is ever present and unchanging. At the high end of this level the world takes on a certain radiance or glow, beauty is seen in everything. Life starts to happen effortlessly as will and intent is manifested through synchronicity. At this level our sense of responsibility towards others is facilitated by using one’s state of consciousness for the betterment of life itself. One is able to perceive the miraculous power of the energy field itself. There is the capacity to love many people simultaneously and as we do we become a conduit for the immense love that springs without limit from the source. Many who have had Near-Death experiences have experienced the Consciousness energy levels of 540 to 600. These are levels that even if they are experienced temporarily, they have the ability to radically change a person’s life. This fact is evident in those people who have had near death experiences. Once one has been exposed to this level, it is as if a new reality is experienced. In this state the distinction between subject and object disappears as there is no focal point of perception. It is not unusual for a person reaching this state to remove themselves from the world as the state of bliss one experiences brings a sense of futility and obsolescence to regular activities. Some are called to become spiritual teachers, others work anonymously for the betterment of mankind while others may become great geniuses in their respective fields. At these higher levels religion is transcended altogether because pure spirituality is the basis of all religion. Perception at these levels is difficult at best to describe due to the change in reality that is experienced. It has been described as occurring in slow motion or a suspension of time and space. There is a sense that everything is alive and radiant in an endless flowing of evolution and matter. The mind becomes infinitely silent no longer conceptualizing as one blends into the landscape being observed. Everything is connected to everything else by a presence whose power is infinite, loving, gentle, peaceful and yet rock solid. This level of consciousness is only reached by a few in each generation and at the highest level only a few throughout history. This level is so far advanced beyond our concept of existence that we struggle to describe it in terms that can be understood. Power generated at these levels is immense. These few become known throughout history for establishing the patterns by which others may follow to reach divinity. The few who have reached the top become a powerful inspiration for many throughout the ages. Rather than being known as individuals they are seen as avatars or lords that represent mans highest consciousness. Their teachings establish the principles for reaching this state. They represent pure consciousness beyond the experience of a body; the pinnacle of a pattern in consciousness we are to reach in human form. Their teachings inspire all of mankind in effect raising the collective consciousness of the human species. The peace they experience is beyond understanding and beyond what words can describe. These people are said to be aware of all lifetimes they have experienced on earth as part of their consciousness, they therefore no longer identify with the body itself. They are said to no longer possess a sense of individuality but rather a merging back into the source of consciousness. In this merging they perceive all things as whole or experience a sense of oneness with everything. The body is only seen as a tool for consciousness, once this level has been reached the body is no longer needed for learning. Their consciousness is not localized rather their awareness is said to be everywhere equally present. 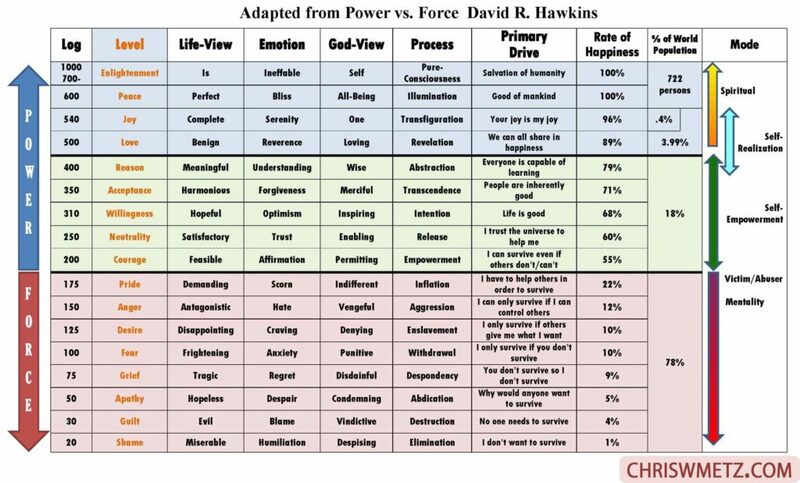 Utilizing the descriptions at each level are you able to identify with the characteristics of certain levels? Once you have pinpointed the level you may be at, can you see how the levels below it affect you? Can you objectively identify the level of those that are closest to you? Can you see the effect these people have on you, either attracting you up or bringing you down? Are you able to see how each level leads to the next level? Can you see how you are triggered or attracted to certain levels? In the next post we will conclude our series on consciousness by summarizing what has been learned. To go there now click here. This entry was posted in Calming The Mind Within, Enlightenment, Self Awareness and tagged consciousness, ego, emotions, Happiness, Personal Growth, self-awareness, victim mentality. Bookmark the permalink.